but when they created the SMRPG Player's Guide they seemed to faulter. 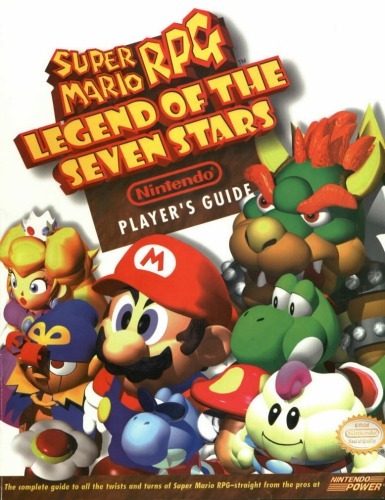 The guide is riddled with mistakes, both spelling and gameplay mistakes. PG 6 & 7: There are just too many mistakes to list! The starting of the game didn't go like this; Mario didn't start brawling with every single koopa troopa in sight! PG 11: Didn't even mention Mallow's mind-reading ability! PG 14: Nothin' on the Princess's ability to revive a trooper completly with Come Back! PG 34: The section on Gaz dosen't really tell anything about the young child, it just tells of the Inn. Also, you can get that Flower Tab untill you beat Bowyer! PG 35: You can't get to the Gardner's house after you save Toadstool! You gotta talk to a mouse in Monstro Town to see him! PG 45: I don't think the Frying Pan is in disguise, the guy selling it is just an idiot. PG 51: Dosen't tell you about the chance to make a total of 4 more snifits from this area! PG 54: No mention of the one chance to get the Amulet. PG 57: Nutin' about being a temporary bellhop! Also, I thought that the Chancelor ruled the Mushroom kingdom with Wisdom and Compasion! PG 64: Where the heck is "By the Sea"? It's called "Sea"! PG 74: Still no mention of the chance to get the chest earlier! PG 76: After every fortune, you can see Belome, but it just takes awhile longer with some! PG 77: Don't you get a Super Suit for 100 jumps? PG 79: Dosen't even mention that Culex is acutally a traveler from the far off galaxy of Final Fantasy 2! PG 83: You can actually play Beetle Mania as soon as you bring Toadstool back to the Mushroom Kingdom! PG 85: Who the heck is Valentia? I thought her name was Valentina! PG 92: That "Czar Dragon" picture looks more like a red Barney if you ask me! PG 94: Reeeeeeal nice description of Vistal Hill. PG 107: Forkies? Where are you? PG 110: Shouldn't Shyper be a Shyster? Wrong image, too! PG 122: It's Super Suit, not Super Jacket. Guide scan courtesy The Mushroom Kingdom.